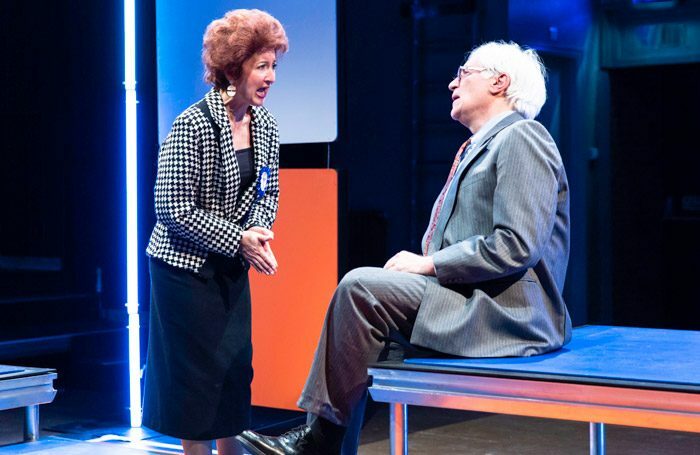 Gregory Evans’ Shirleymander is an entertaining satire on 1980s local politics with a dark contemporary resonance. Successfully adapted from his 2009 radio play (itself inspired by Andrew Hosken’s book Nothing Like a Dame), it lays bare the notorious malpractices of Dame Shirley Porter’s Conservative Westminster City Council but without thrusting home the anti-corruption message too heavy-handedly. Porter was found guilty of gerrymandering – fiddling the demographic make-up of the borough for party political gain – in a ‘homes for votes’ scandal that saw her forcing homeless families to move into unsafe tower blocks or out of Westminster while selling empty council houses to middle-class, prospective Conservative voters. The play shows how the autocratic Porter institutes the secret programme ‘Building Stable Communities’ to use social cleansing as a way of securing power. There’s a certain amount of exposition though not moralising as Evans lampoons Porter and her craven acolytes with Spitting Image-like broad brush strokes rather than psychological subtlety. In his first show as co-artistic director of the Playground, Anthony Biggs directs with a light touch, incorporating an 80s pop-music soundtrack. Gregor Donnelly’s design of neon-lit Day-Glo platforms and panels suggests a tacky TV game show, with projections of archive newspaper reports. Jessica Martin is terrific as the flamboyantly arrogant and unrepentant Porter wearing a variety of colourful outfits, with sterling support from a multi-roling cast including Jack Klaff’s hilariously foul-mouthed right-wing deputy. But the tall shadow of Grenfell Tower (just minutes away from the theatre) looms over the show, with the public inquiry having just opened and the first anniversary of the disaster coming up. With the Royal Borough of Kensington and Chelsea under criminal investigation for corporate manslaughter, Shirleymander’s depiction of socially divisive housing policies rings an alarming bell.